I like to blow dry hair my but I don’t like how long it takes, so I’m always looking for a way to speed up the process, cue Shea Moisture Smooth & Repair Blow Out Cream. The term ‘blow out’ just sounds…wrong. It’s not a commonly used term here in the UK but anyhoo. Now normally I use a heat protectant spray but most of it ends up either trickling down my neck or on the wall, which is just a waste of product. So what’s this blow out cream like? Well it’s quite watery in that you don’t need to squeeze the tube, the cream simply spills out as soon as you open it. The consistency is that of a leave-in conditioner so it is quickly absorbed by into the hair. Firstly I started with washed and deep conditioned hair then I parted it into sections before blow-drying. 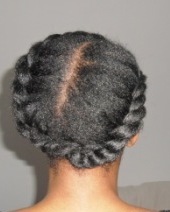 After blow-drying my hair I divided the sections further and put in two-strand twists. As you can see, my ends were a bit raggedy so I took the opportunity to give them a trim. When I’d finished trimming I covered my twists in coconut oil and then un-twisted them to reveal fluffy stretched hair. My hair was not bone straight but that’s not the look I was going for. I simply wanted to stretch my hair to make it more pliable for quick and easy styling. After much playing around I decided on classic jumbo twists as my protective style for the week.